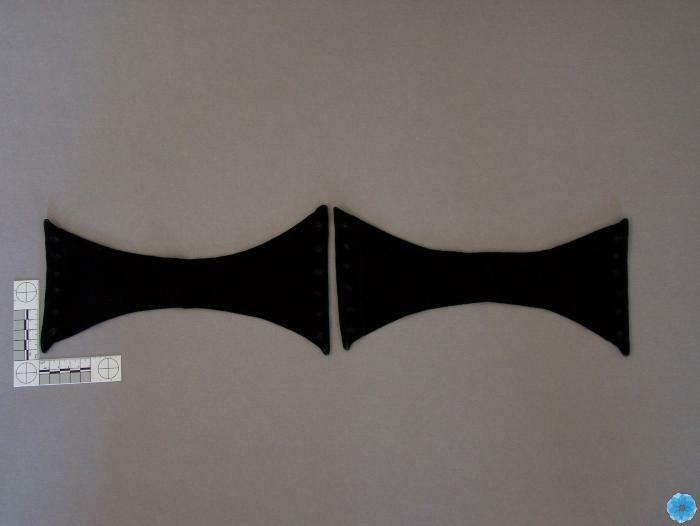 Type of belt that was used with a full skirt and blouse (chemisette or canizou). First instance of use of separate skirt and blouse. The points in the front and back accentuate the small waist. Description: The Swiss belt has two bow-shaped pieces made from black velvet and lined with brown cotton twill. Each piece has strip of bone or metal across either end. There are 6 eyelets in each end which were used to lace the pieces together. Lacing is missing.